Put this place at the top of your must-see natural sights in the United States! 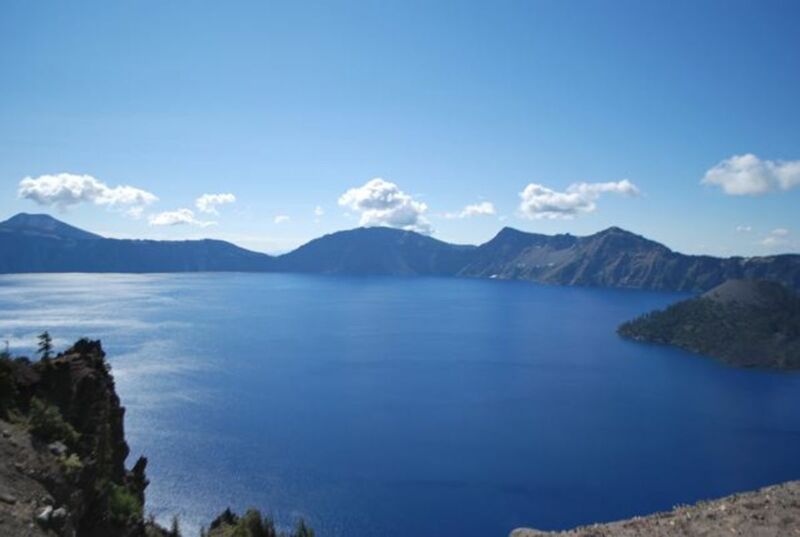 Crater Lake, Oregon is the deepest lake in America - one of the deepest in the world, in fact. The amazingly crystal clear, blue water and stunning geological formations will delight you no matter what time of year you visit. 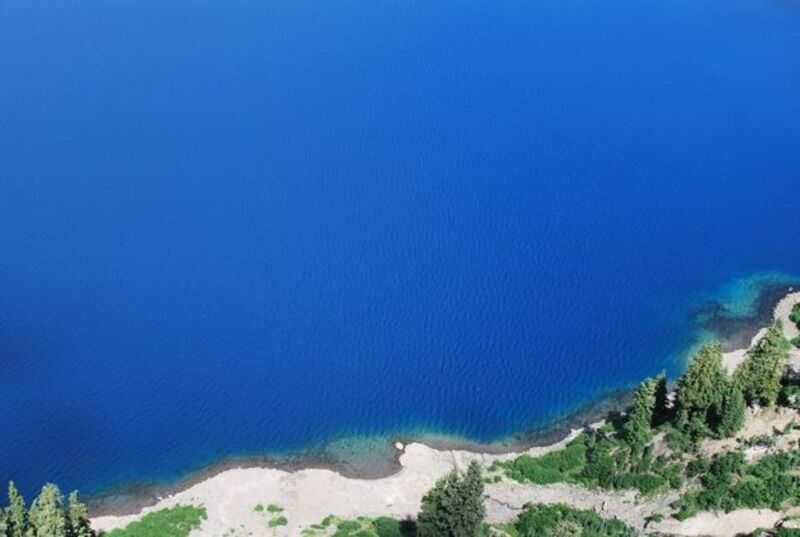 Crater Lake was formed 7,700 years ago when a 12,000 foot mountain imploded on itself. Mt. Mazama was once the highest peak in Oregon prior to the volcanic activity that rocked the region and continues to create amazing peaks and buttes along the West Coast. Where the mountain once stood is now a caldera that includes Crater Lake. Fed entirely by rain and snow run-off, there are no rivers or streams that reach the lake. Wizard Island, in the southwest area of the lake is actually a small volcanic cinder cone, formed by eruptions subsequent to the collapse of Mount Mazama. Crater Lake National Park is a national treasure, protected by the National Park Service. Famous for its intensely blue color and amazing clarity, its no wonder that millions of people visit the area to hike, camp and photograph its natural beauty. The Mt. Mazama eruption may have been the largest in North America in over 1/2 million years! 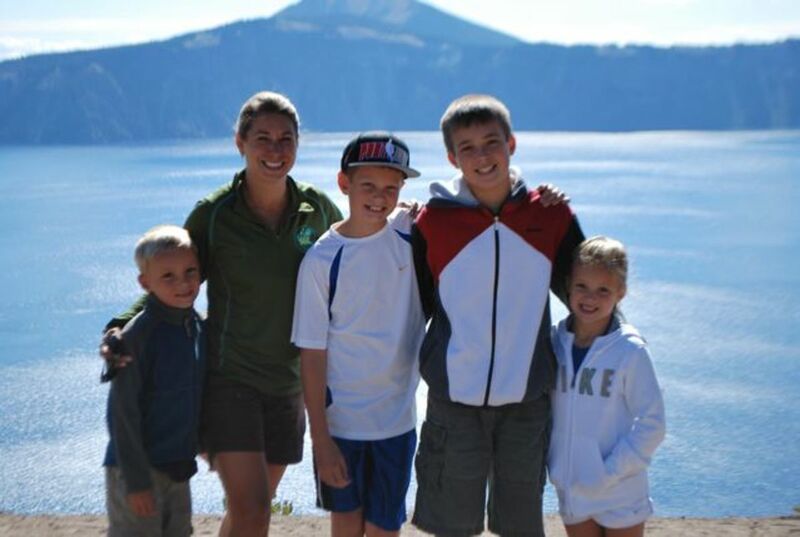 Our family visited Crater Lake National Park in August, which is a good time of the year to get to the National Park. 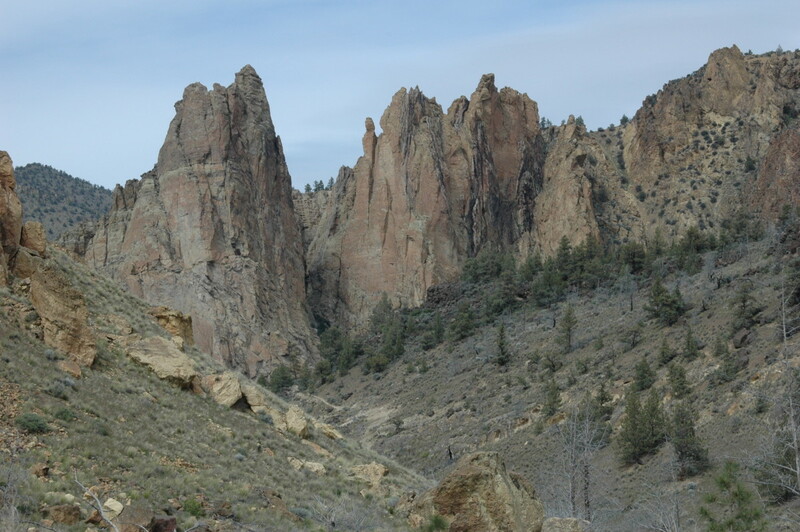 From our hometown of Bend, Oregon, it was just under a 2-hour drive to the park's north entrance. 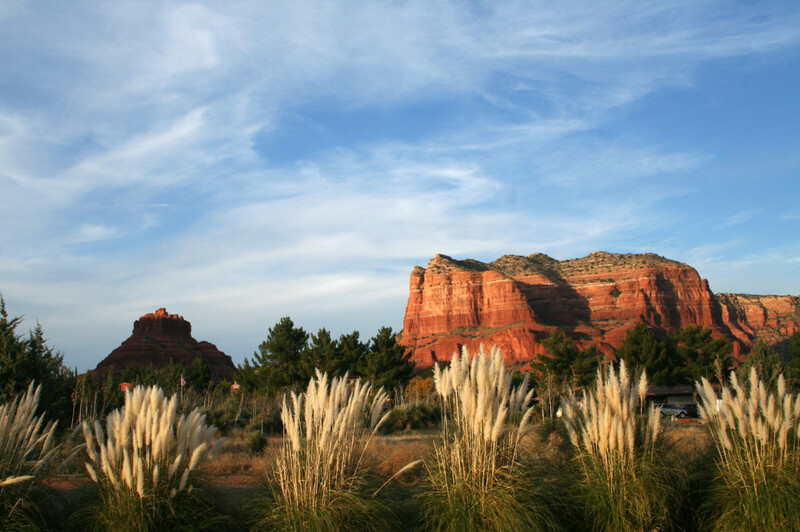 Summer crowds are still heavy in August, but the park's peak visit month is July. From June until October, the roads are generally clear of snow and the Rim Drive around the lake should be entirely open. Although Crater Lake National Park is open year-round, portions of Rim Drive are often closed due to weather conditions through the winter and early spring. We drove the entire 33-mile loop along Crater Lake Rim Drive. Often windy and narrow, if you are afraid of heights, just slow down and use one of the many pull-outs from which you can enjoy the magnificent scenery and take photographs. If you want to let someone else do the driving, consider a Ranger-guided trolley tour around the Rim. Tours depart from Rim Village and take about 2 hours total. The trolley seats 25 passengers in a wheel-chair accessible ride. To help keep the air clean around Crater Lake, the trolleys are powered by compressed natural gas, which is 30-40% cleaner than comparable gas or diesel vehicles! Tickets are $25 per adult, $15 for kids ages 5-13. Under age 5 is free, and seniors are only $22. Tours leave each hour from 10-3 from late-May until mid-October. 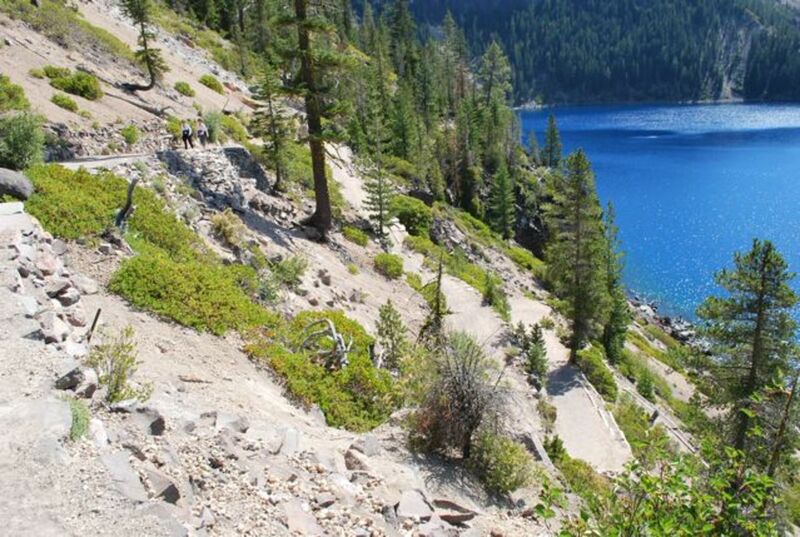 When we visited Crater Lake, we did three of the numerous hikes in the area, including the strenuous 2.2 mile Cleetwood Cove Trail down to the lake shore (the only access to the lake itself in the entire park). While steep, the trail is relatively short - just over a mile each direction. Four children ages 7-13 were able to easily navigate the trail. 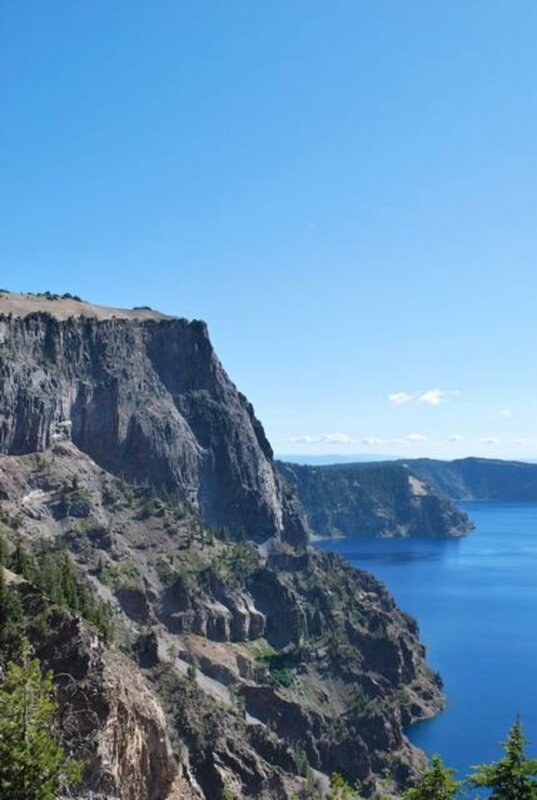 In addition to the Rim Drive, you can experience a 2-hour guided tour of Crater Lake by boat. This will require you to hike down and back along Cleetwood Cove Trail to access the boat. A limited number of tickets each day will allow those who wish to disembark at Wizard Island for a 3-hour stay to allow hiking, fishing and swimming on the island, and then get picked up by a later boat. We decided not to mortgage our home so we could do the boat tour, which is operated by Xanterra Parks and Resorts in cooperation with the Park Service (adults are $28 per person and children are $15 each - our family of 6 would need over $100 for the experience). We will have to go back to Crater Lake for another visit someday, as there are about 90 miles of maintained hiking trails around the lake! Day hikes range from 1/2 hour to 6 hours round trip. 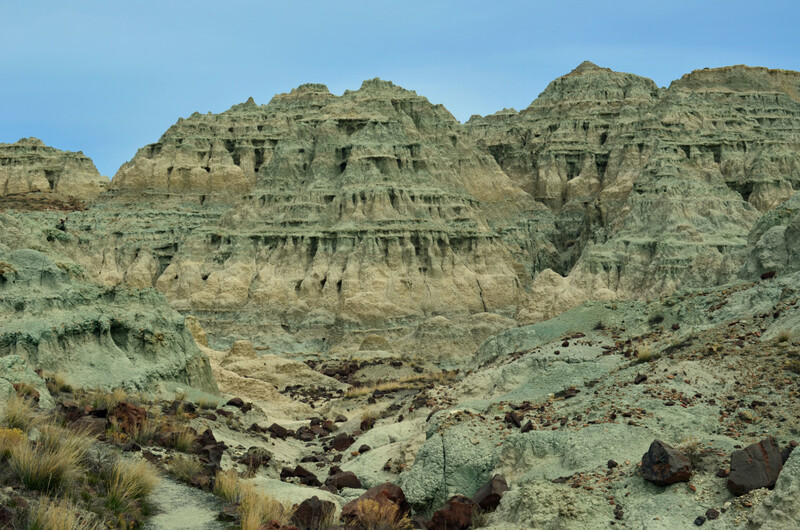 The Park Service has detailed trail information, including distances, elevation gain, estimated hike time and a rating of each hike from easy to moderate to strenuous. For safety reasons, you are advised to stay on the trails and not attempt to rock climb or hike inside the caldera. Dogs are not allowed on any of the park trails, either! If you want to do an overnight hike/camp, you need to get a permit at the park's Visitor Center, or at the ranger station at the Park Headquarters. 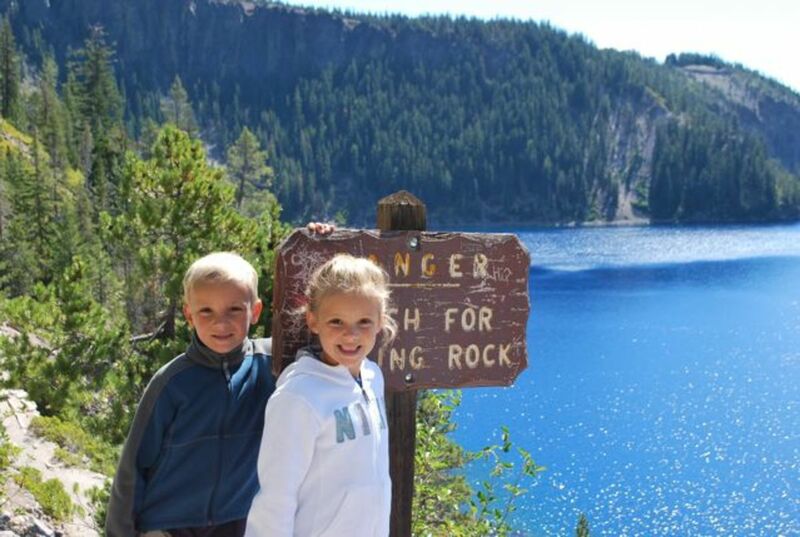 The rangers can advise you about the areas of Crater Lake National Park that are not open to backcountry camping. A final important note - even on a relatively short day hike, you should bring water and food with you. Its easy to become dehydrated along the trails! Rim Village is the main gathering/information spot at Crater Lake National Park. 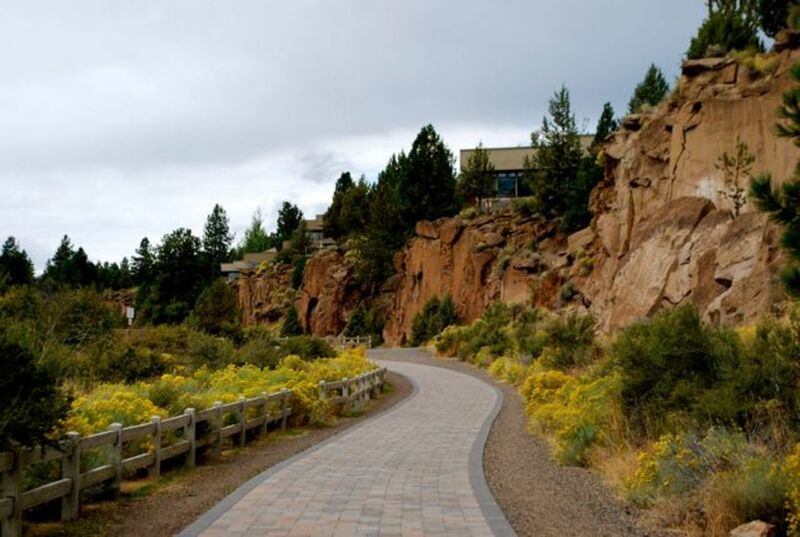 Located at the Southern side of the lake, it includes the Crater Lake Lodge, Annie Creek Restaurant, Rim Village Cafe, Mazama Village Store, two gift stores, two visitor centers and the Sinnott Memorial Overlook. You will definitely want to visit the Sinnott Memorial Overlook. A set of fairly steep stairs takes you down to an open parapet, built into the rock cliffs. 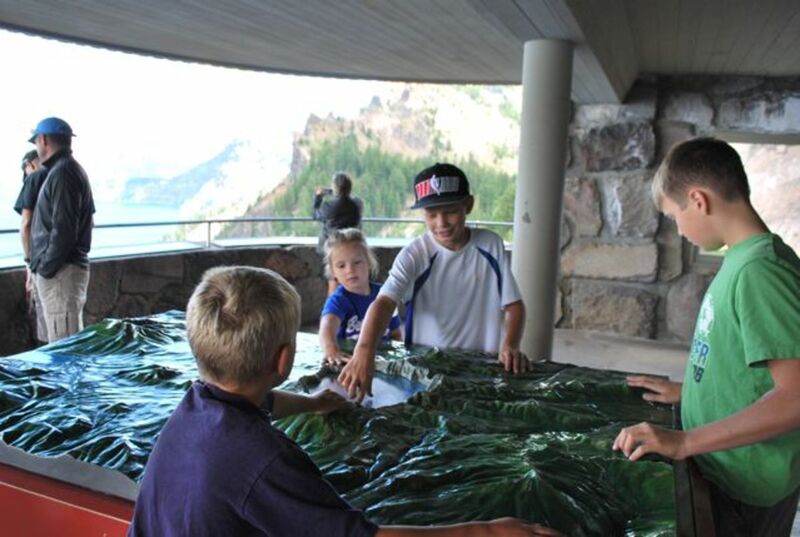 Spectacular views of the lake are enhanced with information and exhibits on the geologic history of Crater Lake. A relief model (shown to the right) explains the sights of the area. There is also an enclosed exhibit room. The overlook is open from June to October. Twice a day, you can listen to 20-minute ranger talks. The site is on the U.S. National Register of Historic Places. The Steel Visitor Center is at Park Headquarters and is open year-round. The Rim Visitor Center, on the other hand, is only open from June through late September. The Crater Lake Lodge looks like a spectacular place at which to stay (we only visited the Park for the day). The historic lodge originally opened in 1915, and was extensively renovated in the 1990s. It has 71 rooms overlooking the lake! As with many other portions of Rim Village, it is only open during summer months (late May through mid-October). 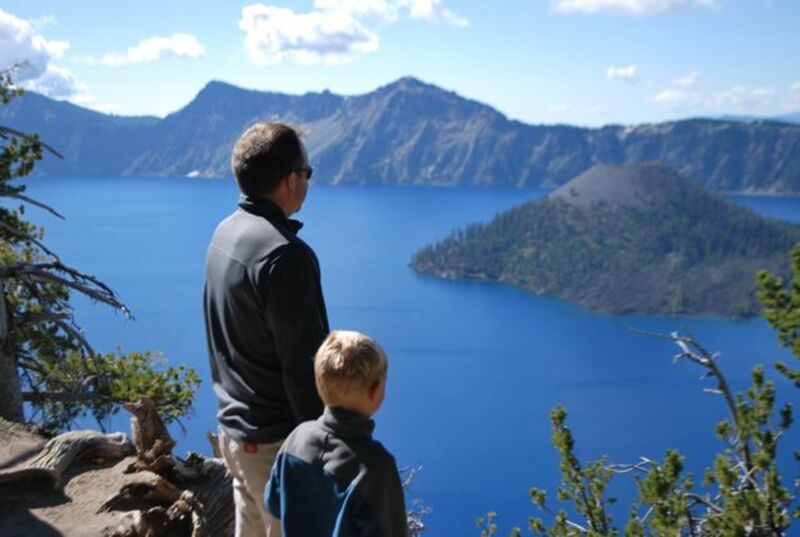 If you want to stay at Crater Lake any other time of the year, you'll have to plan on camping! As noted above, the Crater Lake Lodge is only open during summer months. The Cabins at Mazama Village is another lodging option - about 7 miles south of Rim Village - with 40 rooms. Again, the Cabins are available through the summer, and closed from October until late May. Many people choose to camp at Crater Lake, and there are two campgrounds at opposite sides of the lake. Mazama Campground is south of Rim Village and has over 200 sites - both for RVs and tent camping. You can reserve campsites ahead of time by calling 1-888-774-2728. As of the date of this publication, prices are $27 per night for RV sites and $21 for tent sites. Food lockers, picnic tables and fire rings are at each site. Running water, sinks and flush toilets make this camping experience especially nice! Lost Creek Campground only has 16 sites and is for tent camping alone. Like Mazama, it also has tables, fire rings, food lockers and running water/flush toilets. Get there before noon to get a spot on the weekend. 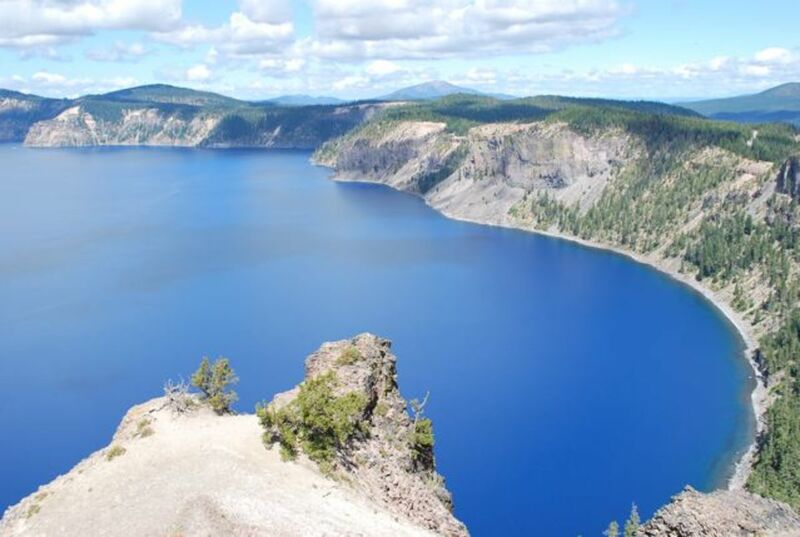 The campgrounds are open during summer months, and if you are particularly adventurous, you can always go camping in the backcountry around Crater Lake. Just don't forget to get your $10 permit ahead of time! Wildlife viewing - elk, bobcats, foxes, deer, squirrels, bald eagles and more! Photography - so much natural beauty! Its hard to believe that, although we've lived in Oregon for several, we had not visited Crater Lake until this summer. I hope that the photographs in this Hub does it justice - but I have to say that you really should plan on visiting this natural jewel in person! 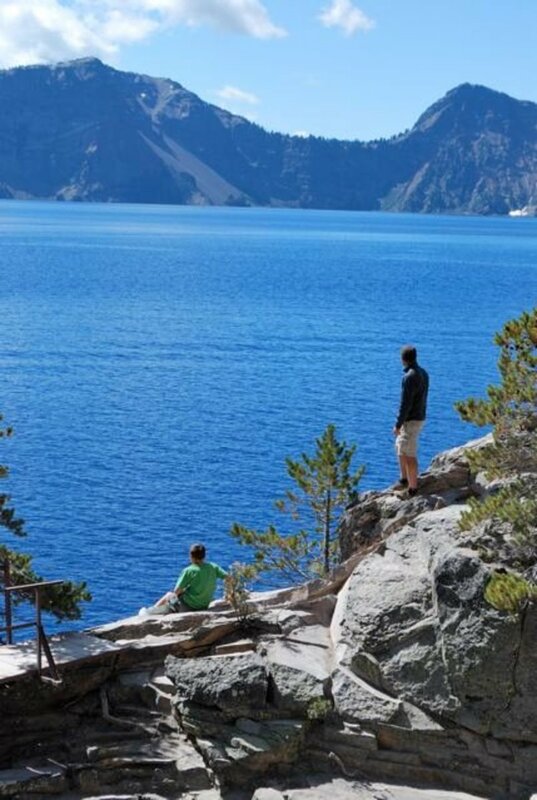 Whether you want to hike, bicycle or just drive around the lake, there are many ways to enjoy the beauty of Crater Lake National Park. I'd like to go back early in the year when the Rim Drive first opens so I can see the snow-covered peaks around the lake. Wildflowers are at their peak from mid-July to mid-August, as well. Since Crater Lake is less than 2 hours away from my home, we are certain to get back there for more adventure and fun! Oregon is a beautiful state. I lived there for a short time back in 1972, but never got to Crater Lake. This is a beautiful Hub, love the photos and they make me want to go there, (which is what they should do!) and I enjoyed reading it. Thank you for sharing. Another well put together hub, with lots of great photos. I especially liked the pics with your family. I have been to the lake many times. I've been on the boat tour and to Wizard Island. Frankly, you need to go on this tour to really appreciate the exquisite blueness of the water. I have also gone on snow shoes around part of the rim, in the winter in deep snow. Fantastic time! I do find your hubs lean heavily on the informational which I can get anywhere. Would love to see more personal anecdotes. Please, don't be offended, it's just a personal preference, it's not an attack on your writing ability or how well you up together hubs. You get an A+ in that. Thank you epbooks! Crater Lake is a must-see place, most definitely! I've heard about this place but still have yet to go. Your pictures look amazing. Thank you! This is good article. This sounds like a great find. Thank you. Voted up! My wife and I visited crater lake a few years ago and it was marvelous. Everyone should see this incredible, natural wonder. Beautiful hub, I will definitely put this on my to see list when I head out west. Voted up! Another place you must see when you visit Oregon! 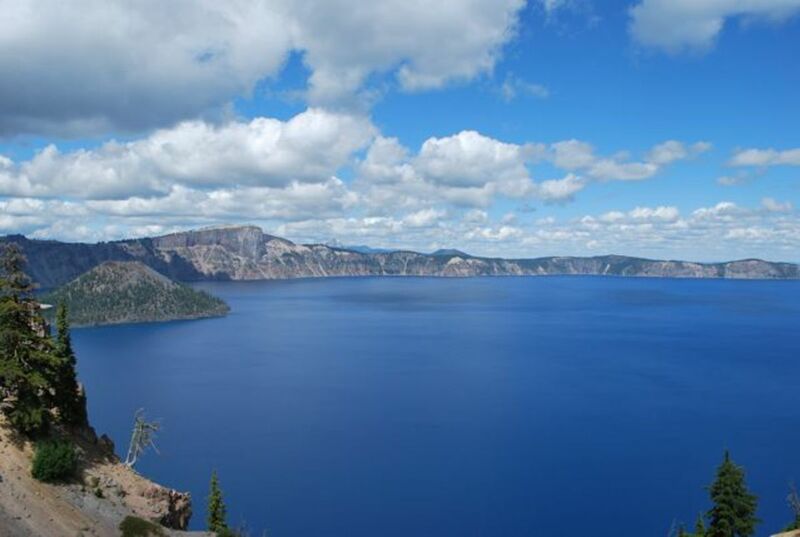 Steph, The blueness of Crater Lake is incomparably beautiful! Your photos and your presentation are well done. Absolutely spectacular! Beautiful hub, thanks for the great advice. That is just what I need. This is an awesome hub. The videos are inspirational. Great Work here. 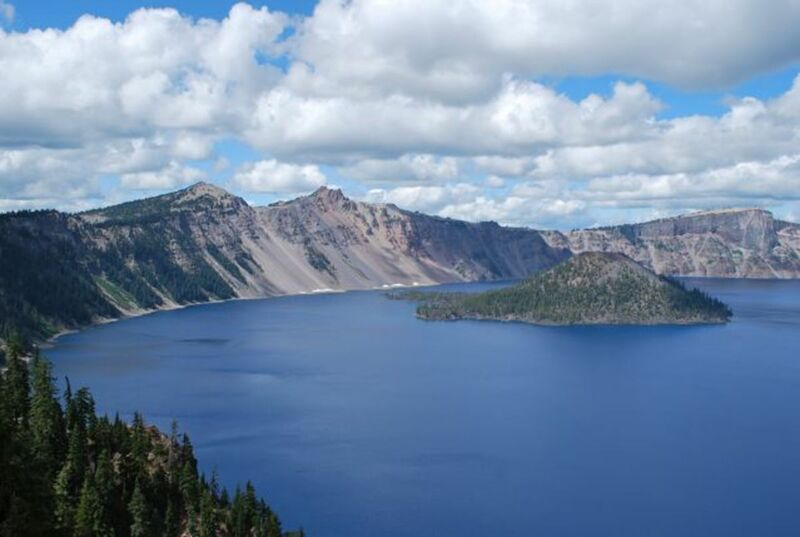 This is a beautiful hub about Crater Lake with very useful information. Great photographs! The one thing I would advise is that no one should try to drive a big RV on the Rim Road. We made that mistake as we though it would be a "shortcut" to the campground. It was a heart-stopping experience! Just came across your feature on Crater Lake. My wife and I went there back in 1993, just 17 years ago. Unfortunately that was the only time in Oregon and the USA. Loved it for 21 days. Also stayed in Bend at a condiminium hotel - a ski centre in winter, we were there in July. Thanks for your article - I will follow you Hubs - if that's the right expression. We live in west Wales in the UK. I still have a friend in Grants Pass, a retired Episcopal minister, I tutored part of his theology ordination course in Oxford back in 1977! So you can guess how old I am now. Still cycling though. Best wishes and thanks for the memories. John. Thank you gorfor - Crater Lake is such a special, beautiful park. I'm lucky to live close by. Beautiful place. Great tip for a trip. Thanks. breathtaking. Per your advice, I will add this to my list "must visits." Thanks for words and sights. Thank you defcon - It is a gorgeous place to visit! WOW, Haven't been to Crater, but want to go now! Great post. Absolutely gorgeous place and one of my favorites to visit. Haven't been in years but thanks for the virtual tour and the reminder that we need to get there one day soon! This lake so blue until I can't blink my eyes. I see the beautiful of this lake as a gift from God. You describe this very well. I wish I could visit this lake someday. Thank you very much. Vote Up. Wonderful, well-written hub! I've been to Crater Lake only once, and it was rather a whirlwind tour--we stopped at the lodge gift shop, and drove the Rim Drive, but it was back in about 1987 with a college geology class field trip/lab class: 11 days on the road, mostly 1-night-stands starting at Yosemite traveling to points north from there. Your hub brought back great memories--and I would like to visit again, for a more leisurely stay! Wow, I'm sad I didn't check this place out before I left the West Coast! I was traveling in Oregon last year too but I had my dog with me which might be the reason I missed this place on my hike list. Thanks for sharing those great photos. I have been to Crater Lake when I was a kid, it was a sight to behold then! After reading your HubPage, I might just have to go and visit once again! I suggest that everyone should visit at least once and learn about how this natural event took place! Great Hub, and some really beautiful pictures. Takes me back to when I was young and my parents took me there. I lived in Wash Sate at the time and have since moved to Florida. Great travel hub!!!! Great - I think you are right Peggy! It will help to read different accounts of our experiences at Crater Lake. Ryan - thank you! I hope you get to Oregon to see this amazing National Park one day! Amazing photos...I am definitely going to add this on my Vacation Wish List. Very comprehensive hub as well, ty. Mission accomplished! Now have your great hub linked to mine. I think that people reading both will come away with a great feel for this unique and beautiful national park. You are so lucky to be living so close to such gorgeous areas! I also did a hub about Crater Lake. We stayed at the lodge. Interested in linking our hubs? Beautiful hub! 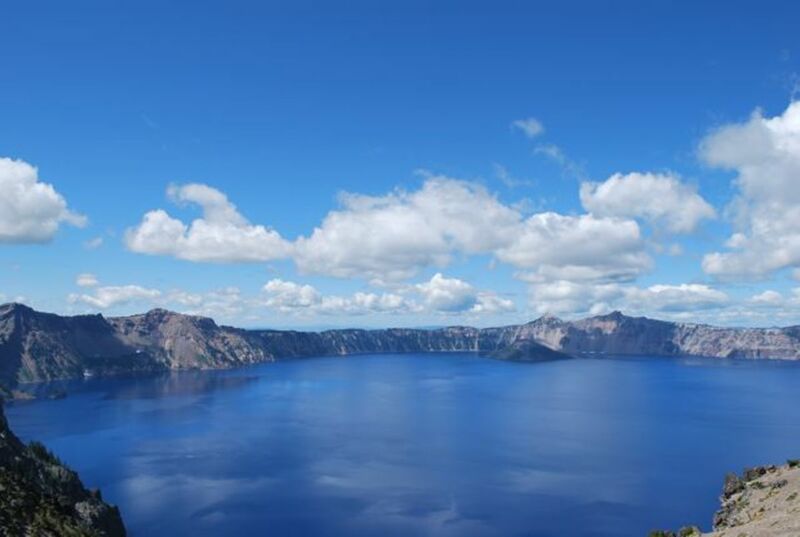 Your photos are absolutely amazing - makes me want to hop on a plane and come visit Crater Lake! Scribenet - we are so lucky to live in beautiful Oregon. Crater Lake is practically at our backdoor! Excellent hub! Great pictures and information! It is both useful & beautiful, but I opted for Awesome! Fabulous Hub,Steph! The photos are stunning and you have to look at the photos to believe how blue that water really is. You are fortunate to live so close to such a wonderful geographic wonder!